Today the Environment, Food and Rural Affairs Committee (EFRACOM) published their report into Waste Management in England. Shlomo Dowen, National Coordinator of the United Kingdom Without Incineration Network (UKWIN), commented: “I commend the report’s calls for maximising recycling, its recognition that put-or-pay clauses in incinerator contracts can undermine incentives to recycle, and the Committee’s recommendation that there should be a moratorium on the incineration of recyclable waste”. UKWIN responded to EFRACOM’s call for evidence with a written submission, and was subsequently invited to provide oral evidence to the Committee. EFRACOM cited UKWIN’s criticism of Government inconsistencies, quoting: “The pro-recycling message is being undermined by perverse financial incentives to incinerate and compost material that should not be…the Department for Communities and Local Government allows planning consent for incinerators that go against Government policies on climate change, energy efficiency and waste hierarchy”. The Report calls for a Minister to be responsible for a consistent approach from the Government, and UKWIN hopes that this will bring an end to harmful incinerator subsidies and an end to the baffling investments from the Green Investment Bank in incinerator projects that are far from green. 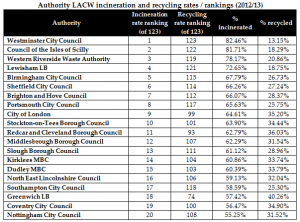 UKWIN provided the Committee with evidence that incineration harms recycling, including what the EFRACOM report describes as “data showing an apparent correlation between high rates of incineration and low rates of recycling” (see table and chart, below). Many long-term waste management contracts include ‘put-or-pay’ clauses requiring local authorites to pay for incineration capacity even if they do not use it, reducing their financial incentive to recycle. 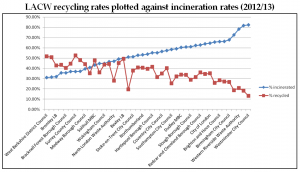 The report recommends that: “…Defra should aspire to achieve recycling rates at the maximum feasible level…” and that Defra should: “…ensure that waste sent to…incinerators is only genuinely residual waste” and “assess whether the use of gate fees is sufficient to achieve this aim and to confirm whether additional interventions, such as regulatory requirements to remove dry recyclables or higher gate fees have been fully considered”. Buckinghamshire County Council has a put-or-pay clause in its contract with FCC to incinerate residual municipal waste. The contract specifies that if the County Council does not provide 100,000 tonnes pa of suitable residual waste then there will be a penalty. One District Council says they have already been told not to exceed a certain recycling level because the County Coucil needs the waste to avoid a penalty. Is this illegal?